Lol! Me? Relax my hair? Not gonna happen but it was fun tricking you 😉 Just don’t hate me! Okay, okay many of you clocked on to what I was doing lol but it was still fun! To clarify for those who didn’t click that it was the 1st of April yesterday, no I did not relax my hair. Fro is very much still alive and kicking! OH YEAH. 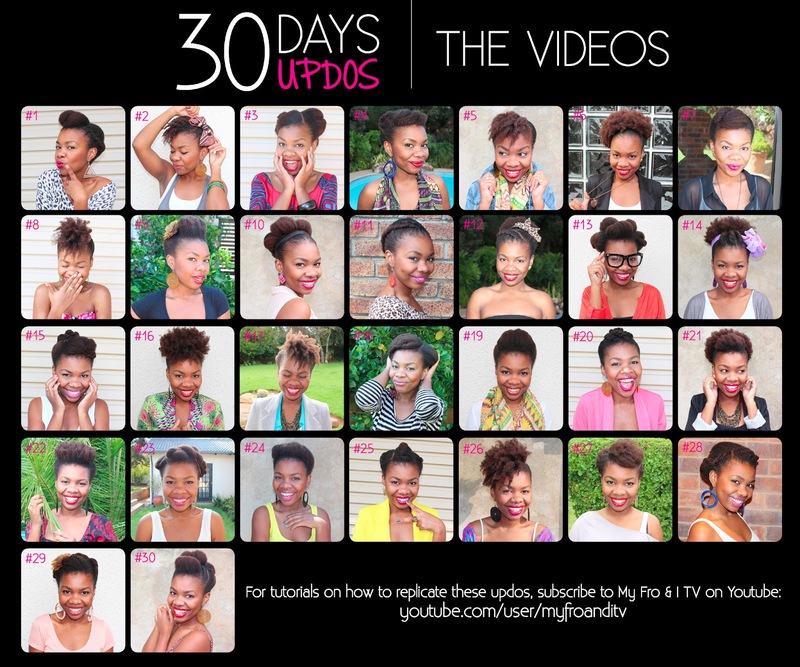 So, as promised, my Youtube channel will be hosting all 30 of my 30 Days, 30 Updos challenge video tutorials! The amount of support I’ve received during this challenge was unbelievable. And although I’d originally wanted to upload the videos as I went along, time-wise it just wasn’t realistic to do (what with my full time job, other blog stuff and well… just life lol). So I’m keeping my promise to all of you who’ve been asking me for the tutorials and sharing them now the challenge is officially over. I’m very excited to share my tricks and continue to show fellow naturals, particularly the resistant haired ones like me that natural hair doesn’t always mean having it in a free fro. Don’t get me wrong, I LOVE my free fro style but sometimes you just want to spice it up for an interview or wedding or date…whatever. In just over one month alone I was able to style my hair in 30 ways, and that’s just updos. The style options for us is endless. Have any of you been rocking updos recently? Please share your photos with me! As usual, you can mail me: myfroandi@gmail.com or click the links below for Twitter etc. I just discovered your website and I am completely reinspired! I have been styling my hair in a few new ways this week thanks to you. I love the hairstyles and love the background of your pics! Love! I just want to thank you for you amazing blog which has been very insiprational to me. I had been toying with the idea of going natural for a while now and the intimate portrait of your experiances in this blog gave me the courage I needed to go through with it. Instead of transitioning and then doing the big chop, I decided to just chop it all off this past weekend. I have always had long hair so to go to the opposite extreme of having virtually no hair (brush cut) is quite different. Its only been a few days and I have received a kaleidoscope of reactions, some as cruel as laughter to absolute praise but whenever I am feeling low I turn to your blog as a great pick-me-up. Thanks again for the great blog! Cheers to strong, healthy natural hair. Wow, thank you for this comment. I wish I knew your name 🙁 But honestly, thank you. I feel so honoured when a reader tells me my blog gives them hope and inspirations because that's the only reason I made it public. I'm so happy for you and excited for this new journey of yours. And I second the cheers to strong and healthy hair!! Amen!